High-performing teams are never satisfied with their performance. They regularly ask, “How can we do better?” They have a certain restlessness. A sense of mission, stewardship, and empathy for the people who will use the things they design and build. It’s our mission to provide tools and make possible development practices that help your high-performing teams improve their game. To that end, Collaborative Lifecycle Management (CLM) 6.0 brings significant new capabilities for configuration management within and across your Jazz tools — with the potential for tools from other vendors to participate in these innovations. In our days you’d be hard pressed to find a software development team that would undertake serious work without using a SCM system. 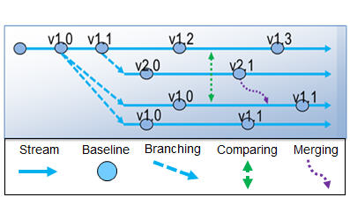 In CLM 6.0, we are extending configuration management capabilities (including development streams, baselines, branching, merging, change sets, comparing across streams) to other tools, so practitioners in other disciplines can gain the same kinds of efficiencies. We are solving this in an open, federated way through (1) new implementations of configuration management in Rational DOORS Next Generation and Rational Quality Manager; and (2) support for Global Configurations as defined in in the OASIS OSLC Configuration Management specification. We expect these capabilities will help teams be more effective in using baselines, doing parallel development, working in large programs of projects, and doing product line engineering. Look for baby steps you can take. Walk now; run later. To learn more, check out the Continuous Engineering blog on developerWorks, or see the short videos on developerWorks. P.S. Many thanks to those of you who downloaded beta milestones and provided feedback, or sat down with us to share your insights about what your engineers need to raise their game. We know you are on a journey; we are too. It’s a privilege to run together.